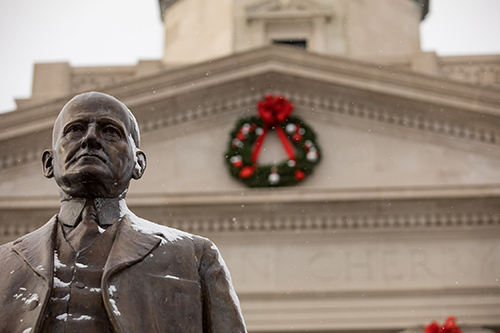 Welcome to a winter break edition of Today@WKU, the daily newsletter from WKU Public Affairs. Today@WKU will return on Jan. 2. WKU's academic colleges recognize fall 2018 graduates: WKU’s five academic colleges recognized their fall 2018 graduates in ceremonies Saturday (Dec. 15) at Diddle Arena. WKU in Glasgow Honors Fall 2018 Graduates During Graduand Ceremony: WKU in Glasgow hosted the Fall Graduand ceremony Thursday (Dec. 13). Twelve students participated in the ceremony, including student speaker Thomas Bratcher, a biology major from Edmonson County who has been accepted to medical school and law school in California. WKU Regents approve leasing property to The HIVE: The property formerly housing the ALIVE Center at WKU will soon have a new occupant, thanks to a lease approved Friday (Dec. 14) by the University’s Board of Regents. WKU will lease 1818 US 31W Bypass to The HIVE, a non-profit agency that works with the disabled. New scholarship program aims to strengthen workforce: The South Central Workforce Development Board will soon be offering a new scholarship program, KY hirED, focused not only on raising regional educational attainment levels but also enhancing employability skillsets among college students. The program will begin in a limited capacity effective January 1 and is expected to be fully operational by mid-spring 2019. Football: LaRussa and Goff Hired to Complete Helton's Assistant Coaching Staff: Head coach Tyson Helton's first assistant coaching staff is now complete as Andy LaRussa (special teams/safeties) and Mike Goff, a 12-year NFL veteran on the offensive line and 2005 All-Pro, have joined the program. Exhibits at Kentucky Museum: A Culture Carried: Bosnians in Bowling Green (through May 11, 2019); Highbrow; plus other gallery and on-campus exhibits. (Museum hours/visitor information) Winter break: Kentucky Museum will reopen Jan. 2. Contact Kentucky Museum, (270) 745-2592. 7 p.m.: Hardin Planetarium Show: Celebrations for a Long Winter’s Night. Hardin Planetarium. Contact Planetarium, (270) 745-4044. 2 p.m.: Hilltopper Basketball vs. Saint Mary’s (California). Diddle Arena. Contact Athletic Communications, (270) 745-4298. 4:30 p.m.: Hilltopper Basketball vs. Wisconsin. Diddle Arena. Contact Athletic Communications, (270) 745-4298. 7 p.m.: Lady Topper Basketball vs. Union (Tenn.). Diddle Arena. Contact Athletic Communications, (270) 745-4298. Winter Term Classes Begin. Contact Winter Term, (270) 745-2478.